HPC:150 (HPC:150) : Hepatocellular carcinoma, well-differentiated, grade 2. HPC:117 (HPC:117) : Hepatocellular carcinoma in Alagille disease. Hepatocellular Carcinoma, FNA and Core Biopsy by Ed Euthman. Definition: HCC is the fifth most common cancer in the world. The incidence of HCC has doubled in the United States over the past 25 years and the incidence and mortality rates of HCC seem likely to double again over the next 10–20 years. In well differentiated forms, tumor cells resemble hepatocytes, form trabeculae, cords and nests, and may contain bile pigment in cytoplasm. In poorly differentiated forms, malignant epithelial cells are discohesive, pleomorphic, anaplastic, giant. The tumor has a scant stroma and central necrosis because of the poor vascularization. Macrovesicular and microvesicular fat is not uncommon, and intracytoplasmic and intracanalicular bile and rarely lipochrome-like pigment may also be seen. Radial acinar and pseudoglandular arrangements of neoplastic hepatocytes may occur around centrally maintained canaliculi (12% of cases), the lumen frequently markedly dilated and containing bile. Duct-like structures may be focally present (5% to 10% of cases), often within a fibrous stroma. Mallory bodies may be seen (4% to 12% of cases), and glycogenated nuclei may rarely occur. Papillary projections of the tumor may occur. Distinct cytoplasmic eosinophilic inclusions (hyaline globules) and rarely ground glass–like cells composed of proteins normally synthesized in the hepatocytes (α1-antitrypsin, α-fetoprotein, fibrinogen, albumin) may be seen. These ground glass cells very rarely may be associated with syntheses of HBsAg (confirmed by immunoperoxidase stain). Tumor cells may show considerable compression of the sinusoids and appear as sheets (compact pattern). Additionally, exceptionally thickened trabeculae greater than 10 cells thick may be formed (macrotrabecular pattern). Accumulation of eosinophilic secretory material within markedly dilated acinar structures may be seen (adenoid pattern). 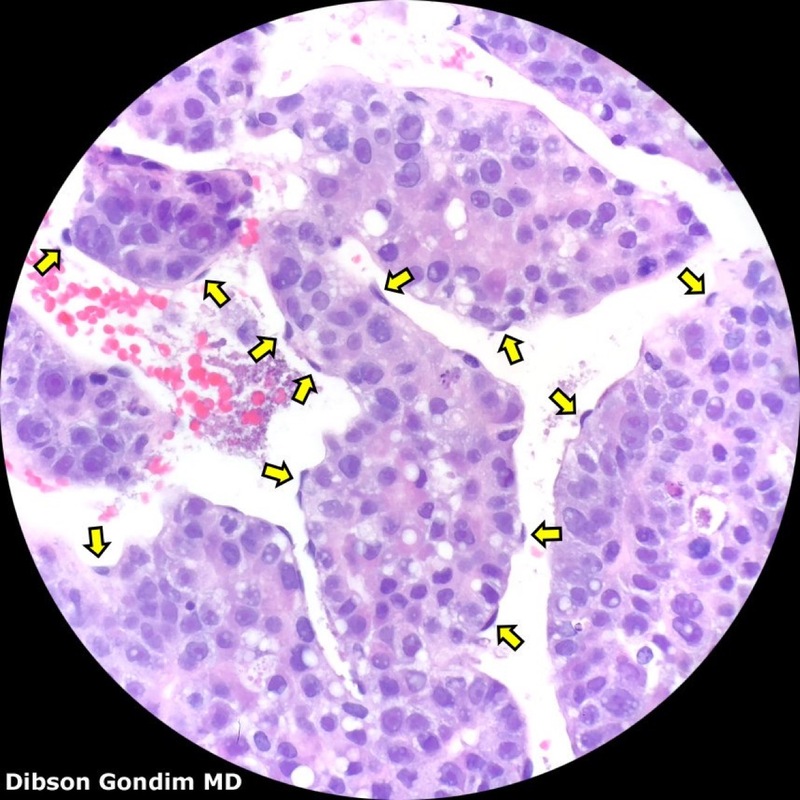 Cords and nests of small- to medium-sized neoplastic hepatocytes surrounded by dense, hyalinized, and relatively avascular collagen may occur (sclerosing or scirrhous pattern). Highly vascularized lesions may show markedly dilated and congested microscopic and in some cases macroscopic hemorrhagic cysts (pelioid pattern). In less well-differentiated tumors, the trabecular arrangement may show the tumor plates to be only one cell thick; however, these cells cytologically are malignant, usually with absence of reticulin fibers along the tumor plates. Mitoses are often present and may occasionally be atypical (tri-polar); however, mitoses may be uncommon in well-differentiated tumors. Abundant small vascular channels are often present within the tumor. Larger vessels may exhibit thrombosis, with resultant ischemic necrosis and hemorrhage of the supplied tumor. Larger lesions may exhibit pseudocapsules (compressed adjacent reticulin fibers) or true fibrous capsules. Although an inflammatory component within the tumor is infrequent, at times a lymphocytic and rarely a neutrophilic infiltrate can be seen. The growth of the tumor merges into the adjacent non-neoplastic trabeculae, not sinusoids. Larger lesions tend to bulge into the adjacent liver with resultant compression and atrophy of non-neoplastic hepatocytes, with associated sinusoidal dilatation and congestion. Tumor thrombi may be present in the portal and hepatic venous channels in from one-fifth to one-third of cases in autopsy series, as well as microscopically within lymphatic channels in portal tracts and fibrous septa. Intra-arterial and intraductal growth patterns may occur but are infrequent. Extramedullary hematopoiesis, microcalcifications (especially in areas of tumor necrosis) and rarely ossification and epithelioid granuloma formation can occur. Clear cell: The cytoplasm is either hydropic or contains abundant amounts of glycogen, these cells having a cobblestone-like growth pattern. Spindle cell: A sarcomatous type of growth is present. Giant cell: Large multinucleated and often markedly anaplastic tumor cells can occur in small clusters or be diffuse. Anaplastic: The tumor cells are pleomorphic and appear in sheets, without any particular differentiation. The neoplasms are often complex, and not infrequently are composed of a mixture of morphologic variants and growth patterns. Cirrhosis is present in 60% to 90% of cases. Additionally, it is not uncommon for the non-tumor liver to exhibit within the regenerative nodules various morphologic characteristics, some of which are preneoplastic (e.g., large and small cell dysplasia, see the discussion of Macroregenerative nodules within this chapter). The tumor cells have eosinophilic cytoplasm and increase in the nuclear:cytoplasmic ratio. Formation of trabecular cords up to six cells thick lined by flattened endothelial cells. High-power shows tumor cells with eosinophilic to clear cytoplasm and round to irregular nuclei with prominent nucleoli. The tumor cells form trabecular cords ranging from six to more than eight cells thick lined by endothelial cells. Thickened hepatic trabeculae are seen in these tumor cells, that could have basophilic cytoplasm. Mitotic figures can be noted. Reticulin stain confirms the presence of hepatic cords more than two cells thick. These thickened cords are an essential feature of trabecular hepatocellular carcinoma. 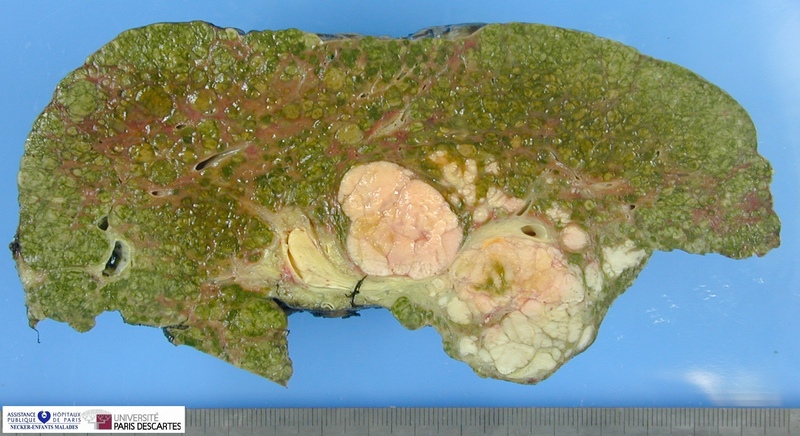 The tumor can form pseudoglands, with bile also present within the glandular lumen. The slightly thickened hepatic cord towards the center of the field can contain a bile plug. Some of the tumor cells can contain Mallory bodies within the cytoplasm. Some tumors can form trabeculae ranging from 15 to 20 cells thick (macrotrabeculae). Tumor cells can contain macrovesicular fat. The interstitial fibrosis between the thickened trabeculae is highlighted in the trichrome stain for collagen. Numerous lymphocytes can surround groups of tumor cells. Rare lymphocytes can also be seen infiltrating into the tumor cell cytoplasm itself. The tumor cells can contain distinct cytoplasmic inclusions that resemble the “ground glass” cells seen in chronic viral hepatitis due to HBV infection; however, the inclusions in this example stain negatively for the HBsAg immunoperoxidase marker. However, the tumor cells can exhibit strong cytoplasmic staining for HBsAg by immunoperoxidase stain. Of note is that if the patient does have chronic HBV infection, this staining characteristic of tumor cells is uncommon. These should not be interpreted as evidence of a bile duct carcinoma component. also referred to as pseudoglandular or acinar and may result in papillary-like formations. A network of sinusoidal vessels surrounds tumor cells. some sinusoids seem to be lined by tumor cells. The widely dilated sinusoids of this liver cell carcinoma result in sharply outlined tumor islands which are very typical of the entity. 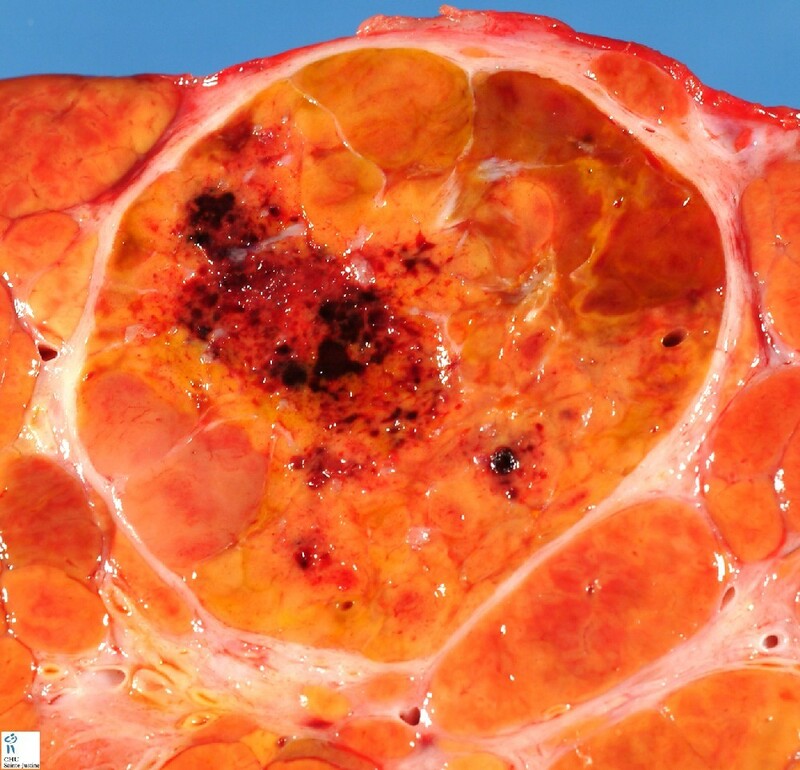 Rarely, the tumor can be black due to accumulation of a Dubin-Johnson-like pigment. Canalicular formations in liver cell carcinoma can be demonstrated immunohistochemically with polyclonal CEA. The presence of hepatic cords greater than two cells thick can best be appreciated with this stain. In addition, decrease to absent reticulin staining among the tumor sheets and along single tumor cell plates also supports a diagnosis of hepatocellular carcinoma. Distinct eosinophilic intracytoplasmic globules may be positive, and may represent α1-antitrypsin (confirmed on immunoperoxidase stains), a helpful marker for hepatocellular carcinoma. 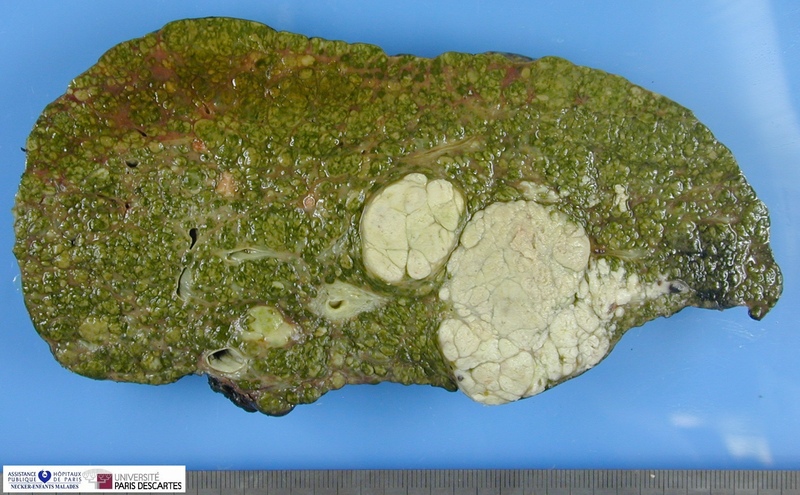 Intracytoplasmic or intracanalicular pigment in tumor cells or acini can be confirmed as bile by variable degrees of green staining (dependent on the amount of biliverdin). Malignant hepatocyte with numerous mitochondria, microbodies, and abundant glycogen. Cells also contain intracytoplasmic bile products. Bile canaliculus with stubby microvilli and cell junctions of the tight and intermediate types. Clusters of electron-dense glycogen particles are also evident. Primary Liver Cancer, or Hepatocellular Carcinoma (HCC) is the fifth most common neoplasm in the world, and the third most common cause of cancer-related death. It is estimated that every year more than 500,000 new cases are diagnosed worldwide, amounting to approximately 5.6 percent of all human cancers. Most HCCs arise in liver cirrhosis through progressive malignant transformation of cirrhotic nodules. Among them, large parenchymal nodules, also called macronodules, represent an early step in the carcinogenesis pathways of HCC. According to histopathology, cirrhotic macronodules are categorized as benign, dysplastic (low or high grade), and malignant. Although grading of macronodules has been described in detail, classification of borderline macronodules is sometimes challenging for pathologists. This marker for endothelial cells helps confirm the presence of thickened hepatic cords, and is usually diffusely positive throughout the tumor. Note that in chronic liver disease, staining of the endothelial cells within the periportal or periseptal zones may occur, but diffuse strong staining is rare. This monoclonal protein shows positive coarse cytoplasmic granular staining in the vast majority of cases of hepatocellular carcinoma (approximately 90%). The staining patterns can be patchy or diffuse and are virtually diagnostic for hepatocellular carcinoma (rarely focal positive staining can be seen in other tumors such as cholangiocarcinoma and gastric carcinoma). This heparin sulfate proteoglycan shows positive both membranous and cytoplasmic staining of tumor cells in the majority of cases of hepatocellular carcinoma and in some cells in instances of high-grade dysplasia, but is negative for benign cirrhotic regenerative nodules. This biliary glycoprotein stains the biliary canaliculi and is diagnostic for hepatocellular carcinoma, staining positively in up to 70% of cases. Cytoplasmic staining can also occasionally be seen. Note that monoclonal CEA rarely (@<@5%) shows positive staining. This marker also stains bile canaliculi, which is diagnostic for hepatocellular carcinoma. The majority of cases of hepatocellular are associated with elevated serum AFP levels. Unfortunately, there is general lack of sensitivity of this stain, with only a minority of cases of hepatocellular carcinoma staining positively. The poorly differentiated variants infrequently stain. When positive, however, AFP is a useful marker for the diagnosis of hepatocellular carcinoma, with some exceptions (e.g., presence in some metastatic yolk sac and germ cells tumors). Monoclonal anti-keratin antibodies with different specificities exhibit immunoreactive staining patterns for hepatocellular carcinoma, examples being CK7 (15% positive), CK20 (20% positive), and CK19 (10% positive). Keratin CAM 5.2, however, shows diffuse or membranous staining in up to 95% of cases. These proteins, among many others, may identify cytoplasmic globules or exhibit diffuse staining, and are useful in differentiating hepatic (positive staining) from nonhepatic origin of the neoplasms. Markers specific for certain tumors are also helpful, such as chromogranin and synaptophysin for neuroendocrine tumors (both primary and metastatic) and estrogen receptors for metastatic breast tumors. Of note is that a combined hepatocellular carcinoma-cholangiocarcinoma does occur but is infrequent, and when present usually clinically behaves more like a hepatocellular carcinoma than a cholangiocarcinoma. This tumor has both histologic and immunohistochemical markers of both types of neoplasms and is felt by some to be a “collision” of two separate tumors; however, many of these tumors also show transition zones from one histologic subtype to another. Very ample tissue is necessary for a definitive diagnosis of this particular neoplasm. 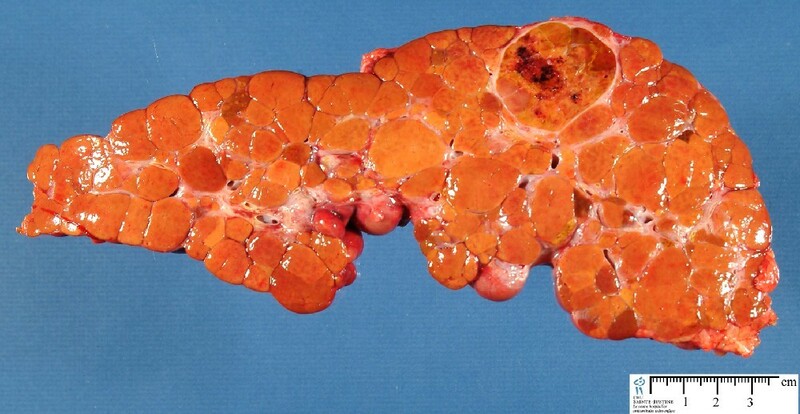 Benign hepatic mass lesions (e.g., liver cell adenoma, focal nodular hyperplasia, nodular regenerative hyperplasia, macroregenerative cirrhotic nodules). Well-differentiated hepatocellular carcinoma may be difficult to differentiate from these lesions on morphologic grounds alone, especially on needle biopsy or aspiration. 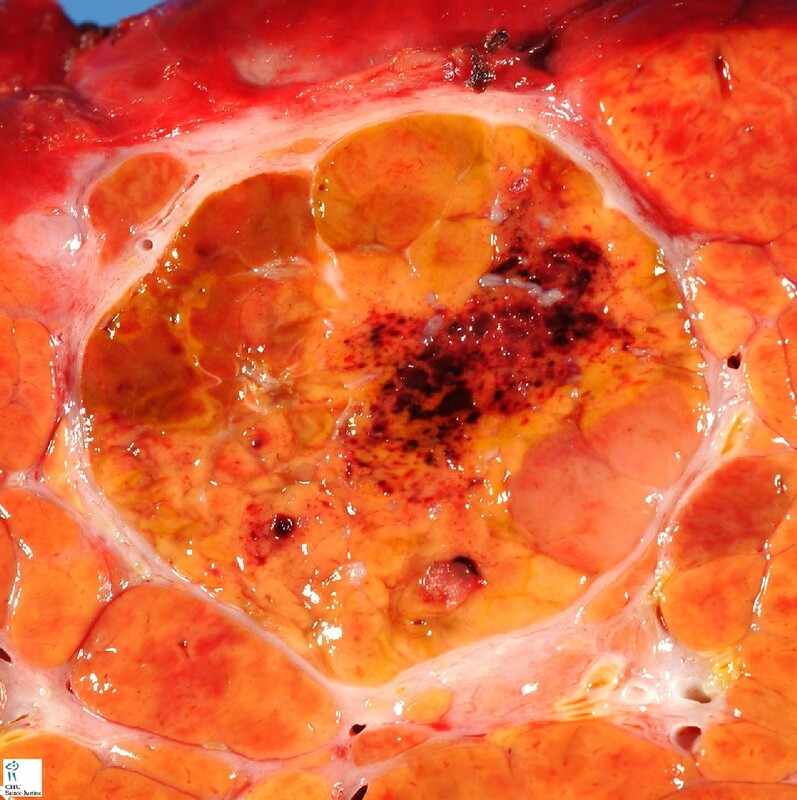 Careful examination for thickened trabecular cords, individual cell atypia with increase in the nuclear:cytoplasmic ratio, presence of mitoses, tumor within vascular structures, and infiltration of tumor into adjacent liver, are important features for the diagnosis of hepatocellular carcinoma. A reticulin stain can help confirm the presence of thickened hepatic cords. The immunomarker Ki-67 may also be helpful, as the nuclei of hepatocellular carcinoma stain positively, while the benign tumors show marked decrease to negative staining. In addition, the clinical history (women taking oral contraceptives for liver cell adenoma, presence of chronic viral hepatitis with cirrhosis in hepatocellular carcinoma), and radiologic and laboratory data (HBsAg positive, elevation of α-fetoprotein in hepatocellular carcinoma) are often very helpful in supporting a diagnosis. Duct transformation and pseudogland formation with or without a fibrous stroma is present in 5% to 10% of patients with hepatocellular carcinoma. It may be morphologically difficult to differentiate from cholangiocarcinoma or certain metastatic adenocarcinomas if the biopsy does not additionally identify areas of more typical changes of hepatocellular carcinoma. The presence of round to oval nuclei with prominent nucleoli, and granular eosinophilic cytoplasm in some of the duct-like cells, suggests hepatocellular carcinoma or a combined hepatocellular-cholangiocarcinoma. In some metastatic adenocarcinomas, such as certain colonic primaries, the enlarged glandular size and arrangement can also be helpful clues. The history of a known extrahepatic primary, with comparison of the liver tumor with slides from the primary, is very useful. Elevation of CA19-9 with an underlying disease of primary sclerosing cholangitis would favor cholangiocarcinoma. In addition, various immunoperoxidase stains can be helpful and are summarized in Table 10-5. Hepatocellular carcinoma, like any other cancer, develops when there is a mutation to the cellular machinery that causes the cell to replicate at a higher rate and/or results in the cell avoiding apoptosis. In particular, chronic infections of Hepatitis B and/or C can aid the development of hepatocellular carcinoma by repeatedly causing the body’s own immune system to attack the liver cells, some of which are infected by the virus, others merely bystanders. While this constant cycle of damage followed by repair can lead to mistakes during repair which in turn lead to carcinogenesis, this hypothesis is more applicable, at present, to Hepatitis C.
Chronic hepatitis C causes HCC through the stage of cirrhosis. In chronic Hepatitis B, however, the integration of the viral genome into infected cells can directly induce a non-cirrhotic liver to develop HCC. Alternatively, repeated consumption of large amounts of ethanol can have a similar effect. Besides, cirrhosis is commonly caused by alcoholism, chronic hepatitis B and chronic hepatitis C.
The toxin aflatoxin from certain Aspergillus species of fungus is a carcinogen and aids carcinogenesis of hepatocellular cancer by building up in the liver. The combined high prevalence of rates of aflatoxin and hepatitis B in countries like China and western Africa has led to relatively high rates of heptatocellular carcinoma in these regions. Other viral hepatitides such as hepatitis A have no potential to become a chronic infection and thus are not related to hepatocellular carcinoma. Individuals with HCC have a highly variable clinical course. The prognostic variability of individuals with HCC supports the notion that HCC comprises several biologically distinct subgroups. This variability probably reflects a molecular heterogeneity that has not been appreciated from methods traditionally used to characterize HCC. Improving the classification of individuals with HCC would at minimum improve the application of currently available treatment modalities and at most offer new treatment strategies. The variability in the prognosis of individuals with hepatocellular carcinoma (HCC) suggests that HCC may comprise several distinct biological phenotypes. These phenotypes may result from activation of different oncogenic pathways during tumorigenesis and/or from a different cell of origin. Individuals with HCC who shared a gene expression pattern with fetal hepatoblasts had a poor prognosis. The gene expression program that distinguished this subtype from other types of HCC included markers of hepatic oval cells, suggesting that HCC of this subtype may arise from hepatic progenitor cells.